The Ring Rail Line will take one step further when trains start stopping at the Helsinki Airport train station as of 10 July. Exceptional arrangements continue: there is a bus connection from the train station entrance to the terminal. The Ring Rail Line was opened to traffic at the beginning of July. The train station of the airport will be introduced in two phases: the Tietotie entrance will open first, and a direct connection to the terminal will open towards the end of autumn. There is a free bus connection from the Tietotie entrance to terminal 1 and terminal 2. Buses run every 5 to 10 minutes with a travel time of 5 to 10 minutes. The buses run during the scheduled traffic of the trains. There is also a guided walkway between the Tietotie entrance and the terminals. 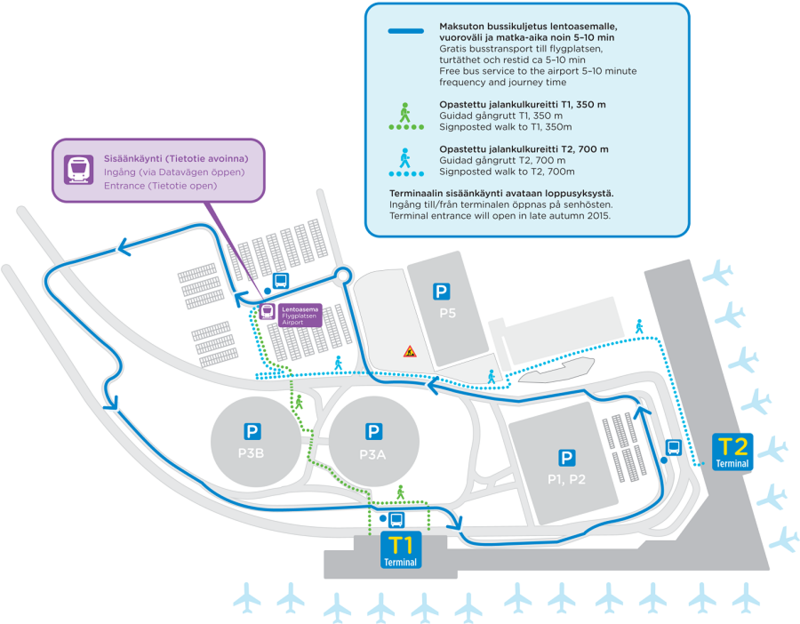 The walking distance from the Tietotie entrance to terminal 1 is approximately 350 metres and approximately 700 metres to terminal 2. Bus traffic to the airport continues as usual. See additional information on the website of Helsinki Region Transport.